A Faster Processor: Both the English and French pages mention "faster performance", but only the French version has specifications. Unfortunately, all we can tell is that the calculator has the same amount of memory (~90MB of Flash, 64MB of RAM) as its predecessor. TI-Nspire BASIC Drawing Support: For the first time, it appears that you will be able to manipulate the graphscreen with the TI-Nspire's own flavor of BASIC. The BASIC variant therefore joins the Lua language for these calculators in allowing graphical programs (and perhaps games?) to be written. Interface Improvements: Many Cemetechians prefer the TI-Nspire over its TI-83 Plus/TI-84 Plus brethren; I am not one of them. In fact, I've been quite outspoken in my criticisms of the Document interface. TI appears to be working to improve this, touting "[n]ew app icons, supported by color-coded screen tabs, improve the user experience." Interactive Graphing Features: Animated graphs, function coefficients that can be adjusted in real time, and dynamic points defined by expressions or sliders all appear to be part of a push to make graphs more interactive and intuitive. CAS-Specific Features: The ability to more accurately solve differential equations and to lock out CAS functionality during tests have been added. Notably, since most of the above appear to be improvements in the calculators' operating system, and the calculator's memory has not been expanded, it is not clear whether these features will also be available as an OS upgrade for the older TI-Nspire CX models. Have you discovered anything else interesting about the new TI-Nspire CX II and TI-Nspire CX CAS II? Do you think we'll get to play with it at T^3 this year? Will we manage to get our hands on the nice red European -T version? Will the TI-84 Plus CE be refreshed as well? Let us know your thoughts in the attached thread. Now give it a touch screen, a 512mhz cpu, and improve the track-pad and I might buy it! So we don't officially know the new type of CPU (or if they're keeping the old one) nor the clock speed yet? I like the refreshed look that TI is giving it, it looks a lot more like a 2017 calculator. (I can't say it looks 2018/2019 since it doesn't have a notch yet. ) I agree with you that the document interface isn't that great, especially if you're not a calculator nerd and you're new to the calculator. I'm very excited TI is adding a version of TI BASIC (Nspire BASIC?) into the Nspire! I never got to program one of these, but my friend said programming it with Lua was pretty unintuitive. Perhaps it could increase Nspire programming here on Cemetech! I'll bet TI will show off their shiny new calculator at T^3, I don't see why they wouldn't. I also don't see why getting a Nspire CX II -T (wow that's a mouthful) would be harder than getting any other new calculator from Europe. Are there any complications you foresee? One last thing, before the Nspire II is released, I think Cemetech needs to finally finish adding a full specs/ details list of the Nspire CX CAS page. You mean the new model isn't called "TI-nSpire CX+ Silver Edition?" So All I need to do is repaint my NSpire CX CAS. add in a fancy-looking II on it, and it should be able to pass off as the newer one? I hope that the OS will still be compatible, then I could make my Nuclear Reactor Simulator in NSpire BASIC... As well as the fact that I find the draw commands pretty useful. I sent TI an email asking about the release date, and they told me it would be released in Spring 2019. 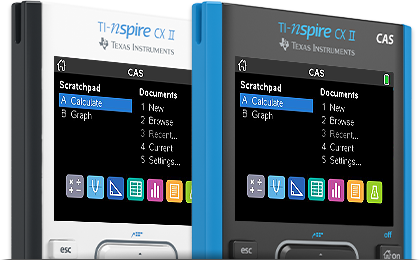 They also said "the TI-Nspire CX II CAS will have the same features that make the TI-Nspire CX CAS Graphing Calculator ideal for math and science courses", but they did not clarify if the older calculators would get the new OS. I'll post when I get a response! Also we can ask for more details at T3 since that will be a few weeks before. I'm very excited TI is adding a version of TI BASIC (Nspire BASIC?) into the Nspire! There was already a basic-like language available on the nspires, I believe they just added some commands. Looks amazing! I particularly like the stripes on the side as well as the new, modern-looking icons. The interactive graphs will most likely be really useful, too. I wonder how much it costs, though. Speaking of new technology, while I was searching, I found this python adapter for the TI 83 Premium CE and was wondering if anyone else had seen it. It looks like it will add a whole new world of functionality to these calculators! Why do the French get all the cool stuff? Edit: This is a more detailed page that makes it look even better. Can't wait till this gets Ndless though... GBA games at full speed? I wonder how much it costs, though. Well we saw the French prices for teachers are the same as before so I guess for standard consumers too. Wow, so there going to release to France first? why? Just got a response from TI: The older TI-Nspire CX will not receive the new operating system. Uh... that would be a really bad move, a huge mistake, from TI. The ASM games from the community make it crystal clear that even with pure software graphics rendering, the existing CX (CAS) models have far more than enough raw power to draw pixels, sprites, and copy / blit buffers for educative purposes... it's not that TI can't do the same, it's probably more that they don't want to, because they want to sell brand-new calculators, never mind the fact that they're barely upgrades over the existing models. If confirmed - and sadly, it will probably be - this is likely to backfire. I saw that the next t3 is march 2019, and one of the things is exciting updates to the ti Nspire world. Yeah, it's propably coming out in march. I found this link to the english page of the TI Nspire CX II-T CAS : click here. Up until now, the Voyage 200 has been my go-to non-school math tool. This very well may change that. My only question: what is a TI-Nspire's capability to create custom functions on the calculator? On my Voyage 200, I have dozens of custom functions I have developed to streamline my calculations, but is there a parallel for this? If not, will the BASIC in the Nspire II introduce this? You can create functions on it. Here is an example. © Copyright 2000-2019 Cemetech & Christopher Mitchell :: Page Execution Time: 0.233927 seconds.